A routine survey added another species to the list of New Zealand's unique indigenous fauna. Last year, as part of a monitoring programme for one of Boffa Miskell’s clients, Christchurch-based ecologist Dr Tanya Blakely undertook an invertebrate survey in the Mackenzie Basin. Tanya worked closely with entomologists Dr Rowan Emberson and Pauline Syrett. Coleopteran (beetle) expert Rowan noticed that some of the tiger beetles collected in pit-fall traps were distinctly different from others. The specimens were found on a very dry, barren terrace surface near the Tekapo River. 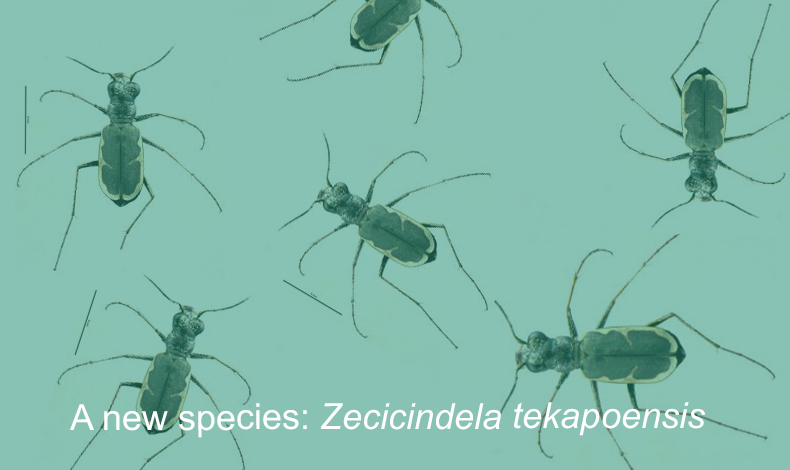 Dr Emberson described this new species and named it Zecicindela tekapoensis – the name reflects that it was found near the Tekapo River. A paper outlining the discovery was recently published in New Zealand Entomologist journal.